Designers saw further potential in the F-15's design to adapt to the air-to-surface strike mission. With the F-111's service life rapidly coming to an end, McDonnell Douglas adapted a two-seat version of the aircraft to employ new night-attack sensors called LANTIRN, (Low Altitude Navigation and Targeting Infrared for Night), increased fuel capacity using conformal fuel tanks (FAST (fuel and sensor tactical) packs), an increased gross weight for the additional fuel and a significant payload, and more powerful Pratt & Whitney F100 engines to push the lot aloft. The result was the F-15E Strike Eagle, nicknamed Beagle (Bomber Eagle) or simply Mud Hen. This aircraft remains at the forefront of the USAF's strike capability, while versions of the F-15E have been exported to various Air Forces around the world. When the USAF started operations in Operation Desert Shield and Desert Storm, the F-15s swept the skies of Iraqi fighters while the F-15E used its precision strike capabilities to pick apart the Iraqi war machine. Even more than ten years later, new generations of aircrews took these very same aircraft into Afghanistan in OEF and back to Iraq in OIF, and the Eagle remains supreme. The F-15E's two-person crew enabled one Strike Eagle to respond to a distress call after a Blackhawk had been forced down and its crew were pinned down by mortar fire. The F-15E crew saw the survivors' infrared beacon with their night vision goggles (NVGs) while the flash of the mortar was visible without. With the backseater monitoring speed and altitude, the pilot did something that transformed night operations - they successfully straffed the mortar position (they were out of bombs before they arrived) and saved the Blackhawk crew. Academy has been engineering a variety of snap-together kits which do fill a void in good kits for younger modelers, but some of their more recent releases have been a bit confusing. Take the case of the 1/700 USS Missouri - it is a snap-together kit and it features the MCP (multi-colored plastic) that makes the kit reasonably presentable without painting. When we examined the kit, many of the parts, especially the 20mm guns, are very small which is unusual for the younger modeler's kit. When I did a quick build of the Missouri, it does indeed snap together though I found it needed liquid cement in places, but those 20mm guns tended to get mangled or dropped without a good pair of tweezers to place the guns. Definitely not your younger modeler's kit. Academy has very recently reissued the same Missouri tooling as a 'Modeler's Edition' which still snaps together, but now includes paint masks and photo-etched parts. Building the Missouri was fun as an experienced modeler, but I was having a hard time understanding the kit from a younger modeler's perspective. So it seems that Academy is looking at a demographic that that has not been specifically addressed in the market, a modeler with skills but lacking the time, energy, and/or dexterity for the standard (more complex) kits. 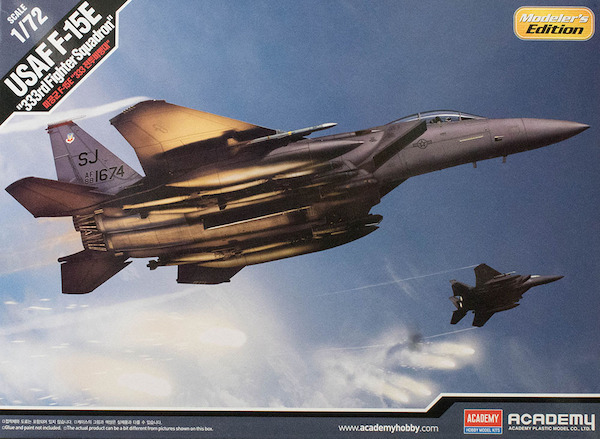 Here we have the lastest release from Academy - the 1/72 new-tooled F-15E Strike Eagle. When you look at the parts in this box, the surface details look better than most 1/72 scale kits and even some in larger scales. The engineering of this kit is outstanding and then you notice that this gem is a snap-together model. But this is no more of a youngster's snap-together than the Missouri. Molded in gray styrene, this kit is presented on eight parts trees (duplicate trees not shown) plus a separate lower fuselage half and one tree of clear parts. Like the Missouri, this kit has small parts like the plug-in tails on the GBU-38 JDAMS or the antennas on the airframe. As I said above, the surface details are very nice even though it still seems odd to see the smaller parts with the snap-together pins, but you won't even notice any of that after assembly. So if you have all three squadrons from S-J AFB on the decal sheet, why isn't this the 4th Fighter Wing instead of the 333rd Fighter Squadron? In fact, the second subject (88-1700) has nice dragon nose art where the other two subjects are wearing standard markings.